The overwhelming majority of black Americans have not voted for Hillary Clinton. Hillary Clinton has won an overwhelming majority of black voters who have participated in the Democratic primaries: the Wall Street Journal places her share at 75.9 percent, and my math puts it at 77.9 percent. This is certainly a better showing than we’ve seen seen from Bernie Sanders, who has won support from about a quarter of black voters. But on this basis, Clinton’s partisans have routinely concluded that their candidate has won some kind of democratic mandate from black Americans. While this is true in the trivial sense — she has won votes from a majority of those who actually voted — this framing overlooks the overwhelming majority of voting-age black Americans who either voted against Clinton or declined to vote at all. In fact, based on an analysis of exit polls, turnout numbers, and census data, an extraordinary 87.9 percent of voting-age black Americans have not voted for Clinton. 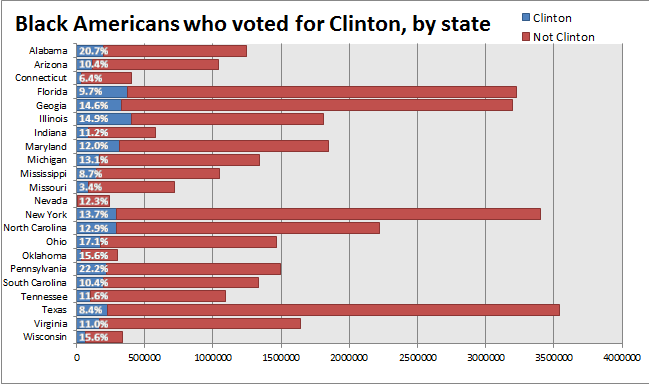 This is the most exhaustive and direct data we have on Clinton’s support among black Americans. On average, about 12.1 percent of them — accounting for around four million ballots — have voted for her and against Sanders. The other 29.4 million voting-age black Americans did neither. A landslide majority of black Americans (82 percent) plan to vote for the Democratic Party candidate no matter who it is. They also report having little faith in the government in general: a majority (58 percent) say that “the government is pretty much run by a few big interests looking out for themselves” (21 percent weren’t sure); a majority (52 percent) say that “most of the time” special interests are “able to get what they want by contributing money to political campaigns” (22 percent didn’t have an opinion); and a majority (57 percent) believe that politicians “lie to get elected” (6 percent were unsure). Regardless, all of this should put Clinton’s relationship with black Americans in a very different light. If a majority or even a plurality voted for her in the primaries, it might make sense to argue that this indicates some kind of significant mandate. As it stands, only a tiny handful of black Americans are voting either way. Again, this could say more about things like barriers to participation in the primaries than it says about what black Americans want. But other polling suggests that, like most Americans, they simply have little confidence or interest in national politics — and that they potentially wanted even more than Sanders or Clinton were prepared to offer.